Three years ago, I set out on the biggest adventure of my life. I’d never been camping before, and I’d hardly ever been hiking, but I had decided I was going to thru-hike the Appalachian Trail. I’d be lying if I told you that I had any idea the profound impact this decision would have on my life. 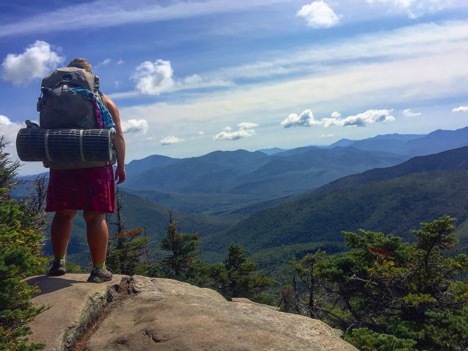 I guess you never really know what all of the nuanced consequences will be of any major decision, but I’ll tell you this: The Appalachian Trail ruined my life, and it was the best thing that ever happened to me. The Appalachian Trail ruined my ability to make small talk. I’m guilty of completely tuning out whenever the people around me are discussing who lost the football game last night or that girl from work’s new boyfriend. I just have no interest in the mundane goings on that most people choose to fill their time thinking about. When you’ve stood on a mountain top with views for miles or camped underneath a star-filled sky, something inside of you changes. You realize that there are so many vast and important things going on in the universe. These are the things I want to talk about, not celebrity gossip. 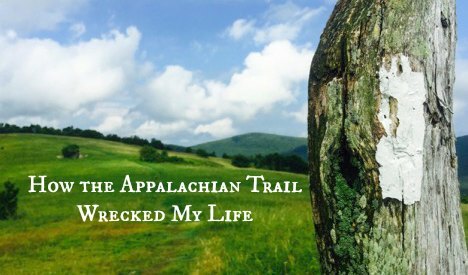 The Appalachian Trail ruined my perceptions of humanity. Before I set out to hike a long trail, I’ll admit to being wary of strangers, being skeptical of someone’s intentions when they offered goodwill. I was a self-described cynic. But, after having complete strangers pay for my breakfast, bring me a cold soda just because, leave jugs of water at a road crossing without ever seeing the face of who they were helping, offer me a place to stay inside their home, and go out of their way to drive me somewhere I needed to be, I lost that cynicism. Now, I’m guilty of seeing the good in everyone. I have the ability to assume positive intentions even in situations that turn out badly, and my favorite person to meet is usually a stranger. 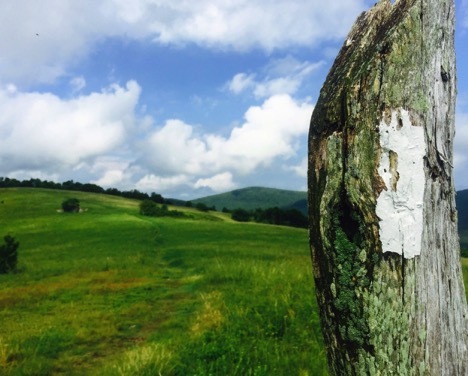 The Appalachian Trail ruined my white picket fence dream. Before the trail, I was living in a fully furnished, decorated home – with a mortgage to boot. Like a lot of Americans, I was neck deep in the rat race, placing inflated value on material possessions that I thought would make me happy. Home was a 1600 square foot house with a huge backyard. Now, I don’t make purchases if the item isn’t a necessity and I live in a 16 foot travel trailer. Rather than stability and security, I crave adventure and mobility. I don’t need things. I need experiences. 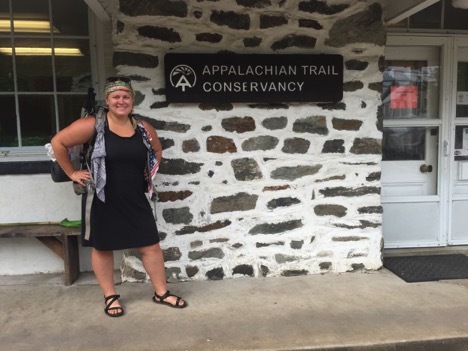 The Appalachian Trail ruined my negative body image. I’ve always been chubby, and ever since I was of the age where I started comparing my body to other girls, I’ve been self-conscious about my weight. I won’t say that the Appalachian Trail completely destroyed this feeling, but when you are literally climbing mountains day in and day out, your thoughts about your body are bound to change. For three months, my body was able to carry me and all of my earthly belongings over countless mountains for 8-10 hours a day. The longest I’d ever walked in a day prior to this was probably 5 miles. Three weeks into my first thru-hike attempt I knocked out my first 20 mile day. TWENTY MILES. You could never have told me this body was capable of that. While I still struggle at times with accepting my weight, I have a much healthier relationship with my body post-hike. I’m proud of what it is capable of, and thankful that it is fit and healthy enough to continue to do everything I ask of it. 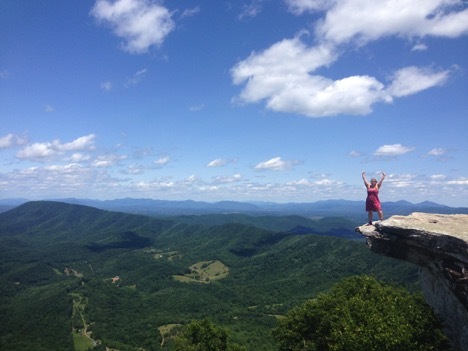 The Appalachian Trail ruined my perceptions of beauty. Before the trail, I remember being that judgy girl who wore fake eyelashes to class and thought girls didn’t look “put together” without makeup. While hiking, I had somehow made it to Pearisburg, VA before I caught a glimpse of my wild and feral makeup-free face in a streaky mirror at a cheap hotel. I startled and looked away, disconcerted because I thought the girl in the mirror was beautiful, but there was no way that was me. I went from someone so insecure that I didn’t leave the house without a full face of makeup to someone who barely wears any, because I think a natural face is prettier and a dirty, sweaty, flushed face on top of a mountain is the most beautiful thing I’ve ever seen. The Appalachian Trail ruined my plans for the future. Before hiking, I thought I’d get married, have a kid or two maybe, and spend my days working to pay off that house I’d bought. I had gone to graduate school and was going to become a teacher. I had a long-term boyfriend that I was planning to marry. I spent 26 years chasing this dream only to find out that it wasn’t really mine. It took walking through the woods for three months to figure that out. I sold the house, I broke up with the boy, and I worked service-industry jobs for a while until I figured out what it was that I really wanted. I feel like my life started the day I stepped foot on the Appalachian Trail, passed that first white blaze, and pointed my heart toward Maine. Until that moment, I’d been going through the motions that I thought I was supposed to go through. I’d been waiting for life to happen, not realizing that it was happening all around me and I was missing the point. Now, I feel as though I have crammed more life into these past three years than I experienced in all of the first 26. I’ve attempted two thru hikes, each lasting 2-3 months. I’ve walked over 2,000 miles on the Appalachian Trail, and countless hundreds on other trails. I’ve gone hiking, camping and backpacking completely alone. I moved into a camper and traveled the east coast for a year with just my dogs for company. I’ve checked items off my bucket list, such as climbing a 14ker (14,000 foot mountain) and learning how to back-up a trailer. I am so much more self-assured, confident, and bold than I ever was before. I have friends all over the country that feel like family. I’m on a course so different from the one I was on pre-hike that I often don’t recognize things I said or did back then as being my own memories. I may be less financially stable, I may not be certain what the future holds, I may feel at times like I’m just blowing aimlessly in the wind. But I’m endlessly, deliriously, insanely happy. 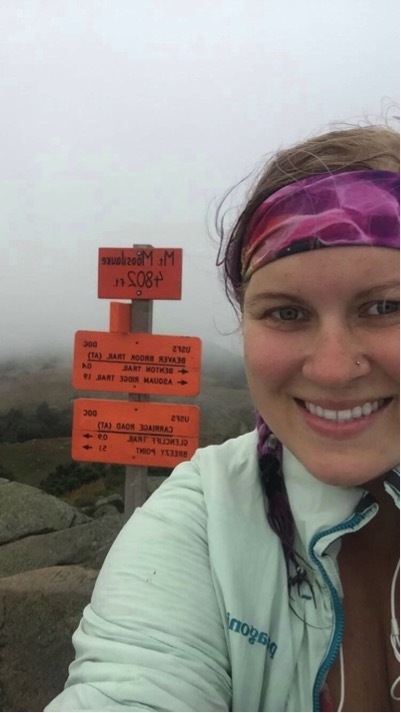 The Appalachian Trail ruined my life, and it was the best thing that ever happened to me. Stacia: It was a pleasure having you! We love how the Appalachian Trail has ruined your life! In addition to articles about the Appalachian Trail occasionally we will post about other travels we have had. This piece of travel writing is an excerpt from my memoir Costa Rica Curious and takes place on our due diligence trip before we moved to Costa Rica. Grecia may have gone to bed late the previous night, but that did not keep it from waking up early—and cranky. No, wait, that was me. I was the cranky one. The combination of unusual noise, an unfamiliar place, and a thin mattress caused a fitful sleep. Our room at the bed and breakfast shared a wall with the outside, the street just 20 feet from our bed. The road swarmed with cars and trucks as the sun came up. Street noise from automobiles and unmuffled motos reached into our room along with birds squawking in the trees, the grinding of metal garage doors going up as shop keepers prepared for the day—and was that a jackhammer? It was 5:30 in the morning. Sitting between 7-10 degrees above the equator, Costa Rica belongs to the Central Time Zone, but without the need to ever spring forward. In addition to creating the need for sunblock, the orientation to the equator means the country has a consistent and corresponding sunrise and sunset. The sun rises around 5:30 a.m. each morning throughout the year and sets almost exactly 12 hours later. My mind was already working on solving the problems this second day in Costa Rica would present. The first obvious problem? Getting into the shared bathroom to take a shower and take care of business without incident or awkwardness. Jen had drifted back to sleep so I let her know I was going to take a shower. I tinkered with the idea of not putting on a shirt. I mean, it was early in the morning. Who else was going to be up? My prudish nature won out and I donned a shirt, threw the bath towel over my shoulder and quietly opened the bedroom door. Sneaking around the corner into the hall like a thief, I saw the bathroom door standing wide open. Jackpot. I pranced into the bathroom, startling Mary. I walked to the kitchen to get the drink of water, ignoring the weight around my neck. The innkeeper was up too and willing to make coffee and idle chit-chat. We had a great conversation about Grecia and discussed strategies for seeing different areas of the town when we returned in a week. We planned to leave after breakfast to head to the beach, so our second task, after washing the travel grunge from the day before, was to take possession of our rental car. Once the rental was delivered to the B&B, we would get on the road and drive to Guanacaste (a province in the northwest quadrant of the country). We were going to spend several days at various beaches in the region to see if beach life was a better fit for us than mountain life. After discussing with Danny the upcoming drive to Guanacaste and what to expect, our discussion petered out and he had to make breakfast. I thought it was a great time to see if the bathroom was open. The bathroom was open; no one was in it either. Now that I had access to the shower, I began running through the instructions given the day before regarding shower operation. Something about managing the temperature by adjusting the water pressure to the showerhead. The day before, Danny had shown us the bathroom we would be sharing and warned us there were some tricks to operating the shower. The four of us crammed into the small space, and being the tallest (and least attentive), I was relegated to the back, furthest away from the tub where the discourse was taking place. No problem. It was a shower. What was there to know? I did hear the phrase hot water on demand and was impressed with the upgraded hot water system this simple bed and breakfast seemed to have. Jen and I had recently replaced a hot water heater in our Dallas home with a tankless heater. We lived in a gated community of about 120 homes all designed and constructed by the same builder; a builder who had the brilliant idea to install the hot water heaters for each house in the attic space of the two-story abodes. Twelve years after being installed, heaters in the community started failing, soaking homes from top to bottom, and within a six-month period the entire neighborhood had new systems. When we chose ours, the sales person had tried to sell us the hot water on demand upgrade. This would allow delivery of hot water immediately, without the need to brush your teeth after turning on the shower to allow time for the hot water to travel to the showerhead. Change was in the air for us, and since it seemed we would be selling our home and downsizing, we passed on the upgrade. My respect for our humble accommodations went through the roof knowing it had the modern marvel installed. After entering the bathroom, I closed and locked the door, threw my terry-cloth ascot onto the toilet, reflected, then drew open the shower curtain. There stood the object of discussion from yesterday—the showerhead. Initially I was confused, then afraid. There were what appeared to be electrical wires coming out of the showerhead—the place where water comes out. Following the path of the wire with my eyes, it moved away from the head, disappearing in the wall. I had heard and read about suicide showers during our research for this trip, but that information didn’t prepare me to see one in my bathroom. The concept is simple. First, electricity is run to the showerhead. The electricity supplies current to a heating element, which then heats the water as it passes over the element before it comes out of the showerhead. One could say it heats the water on demand. The shower was really no big deal. The water stayed warm as long as I needed it to and I did not feel any electrical tingles. This feat of engineering is ubiquitous in Latin America, and you never hear from the people the showers kill, so they must be safe. I saved myself from scorn by not telling Jen that hot water on demand is code for suicide shower. I was sure she had listened during the training session. Instead, I put on shorts and a t-shirt in anticipation of the breaking of bread soon to come. We made our way past the bathroom, void of people, and into the kitchen. We were greeted by the innkeeper and his wife who were making what smelled like a wonderful breakfast. We were told to have a seat at the extra long table, capable of fitting a houseful of guests. I sipped another cup of Costa Rican coffee and had a fresh squeezed orange juice chaser at the ready—plenty of things to keep my mouth occupied should I have nothing to say at breakfast. Mary arrived shortly and we talked about our trip ahead and how well everyone did not sleep. Next to arrive at the table was a group of three, all impeccably dressed: father, Joe, and son, Timmy, in short-sleeved dress shirts and mom, Judy, in a full-length dress. They were Jehovah’s Witnesses from Ohio where Joe had a successful business but was ready to retire. Joe was in a leadership position at the church and was looking to start a church in Grecia or some other small town in the Central Valley. They had run out of people to witness to in the States and heard there were lots of Catholics here, was my guess. It is funny how often God leads people to the place they want to be. My coffee drained, I reached for my juice. After the initial pleasantries, the conversation turned to Costa Rica and all the wonderful things to be found and experienced. Breakfast arrived: neighbor-fresh eggs, not-quite-burnt toast and the most fabulous medley of fruits from the yard, mango, banana and papaya. Ok, so I really don’t know where the fruit and eggs came from, but with my rose-tinted spectacles firmly placed over my eyes, the food had to be local and right from the backyard; if not that, then from a neighbor. The conversation became comfortable, as we all found common ground, and the food and drink flowed when discussion stalled. I waited for someone to mention something about oddities to be found in the bathrooms in Costa Rica, but no one wanted to talk of signs or showers this early in the morning. Jen and I left the table shortly after my fourth glass of orange juice. We needed to finish packing our clothes in anticipation of the arrival of our rental car. Check out time was 10 a.m., so we had scheduled our rental car to be delivered at 9:00, giving us time to look the vehicle over, sign all the paperwork and check out without having to rush to make our scheduled departure time of 10 a.m. Living a busy, fast-paced life in Dallas required us to be planners—well, Jen to be a planner, me to be a follower. Everything we did was planned and scheduled, and we were famously on time or early for every function. We were in Costa Rica, not Dallas, and we were experiencing tico time, that attitude of living in the moment and not adhering to a schedule if it got in the way. 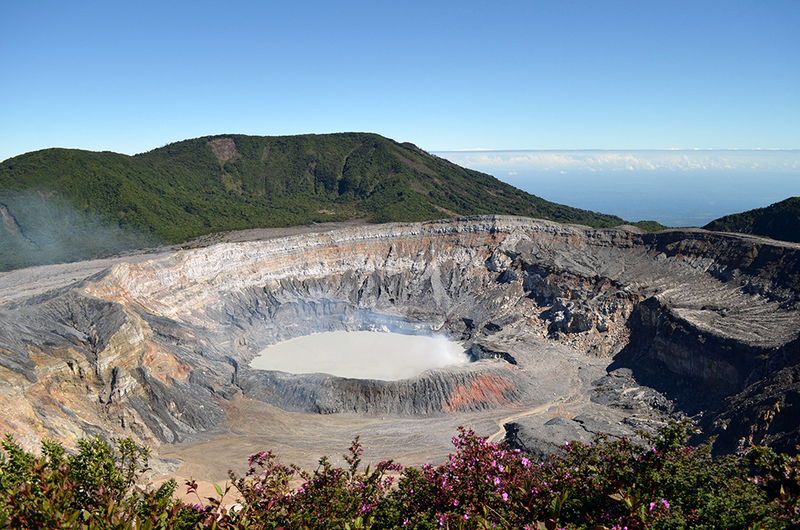 If Costa Rica had not been part of the Panamanian Isthmus, but instead surrounded on all four sides by water, this mentality might be called island time. Or if we were back in the U.S., it would simply be called the cable company. Scheduled times didn’t mean a whole lot, and while we should be prepared at the scheduled time, we should also be prepared for the reality that the Costa Rican participant might be late or not come at all. The attempt at scheduling an early rental drop was not only so that it coincided with our checkout time, but also to get us on the road in good time. We had heard that driving at night was much more dangerous than in the light of day. We took this warning seriously and were trying to be safe. As such, we were anxious as we had four to five hours worth of driving ahead and we now knew the sunset would take place early in the day. Shortly before 11 a.m., the driver arrived with our vehicle, a Nissan SUV with 4-wheel drive. We went over the paperwork, authorized a huge deposit on our credit card, walked outside to the vehicle and took a minute to circle it; we were predators eyeing our prey, duly noting the multitude of scratches and dents. We then received a quick tutorial on how to use the navigation system, and with keys in hand, we loaded up and headed off to experience driving in Central America.